Titles and composers of the pieces and background information. This could include some biographical information as well as some details of other pieces by the same composers or artists. For pieces that have been originally performed by another artist, you should identify any aspects where your rendition differs significantly from the original version. The reasons for selecting the pieces that were performed and how the pieces influenced the flow of the programme as a whole. An analysis of the technical and musical challenges of the pieces and how these challenges were overcome whilst preparing. Information on any alternative tunings and/or effects that were adopted. An Exam Information Booklet and syllabus are available providing full details on the requirements and format for each of these concert diplomas. 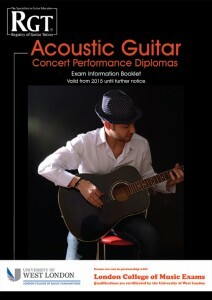 This entry was posted in Acoustic Guitar Exams and tagged Acoustic Guitar Exam Previews, RGT Acoustic Guitar, RGT Acoustic Guitar Exams by Alan. Bookmark the permalink.